I have seen some articles about dog massage that are interesting to me. My Jake has been showing signs of arthritis and is taking glucosamine for this. What I want to know is if some massage and stretching would be good for him. It seems like I have heard that is good for people with arthritis, so why not dogs? If so, any thoughts on how I could get started? What a great topic, Jennifer! It‘s a wonderful idea to do massage and stretching with your dog. There are many proven benefits of massage, including decreased muscle pain and stiffness. And of course, I love anything we can do to strengthen the human-animal bond during the last years of life, when more physically demanding activities may not be possible. I think a picture is worth a thousand words when it comes to massage. Luckily, the internet has countless free videos illustrating dog massage techniques, made by people with varying degrees of skill and knowledge. I like this site about massaging your animal, not only because the massage therapist has obvious training, but also because there are separate short videos for each body part. Having material broken down into parts always helps when we’re learning something new. Other websites such as The Lang Institute of Dog Massage in Colorado sells videos that are more in depth, and even offer onsite workshops. One of my favorite forms of bodywork is “TTouch”, or Tellington Touch, named after Linda Tellington Jones. Linda’s books and videos are filled with heart-warming and inspiring stories of the animals she has helped through the use of her bodywork techniques. I highly recommend that you check it out – it’s not only easy and safe to practice at home, but can be very effective for many physical and mental conditions. After one short workshop with Linda, I returned home and immediately put it to use in my vet practice. I was able to turn a tense horse into putty with just a few minutes of TTouch, making it super easy to do my exam and treatment without the use of tranquilizers. Needless to say, this totally convinced me (and the horse’s amazed owner) of its value. Who knows, you might find that you and Jake like one of these techniques so much, you’ll want to get certified so you can offer it to others. But giving massages may result in a body ache or two for you, so don’t forget to go get a massage for yourself! Have a question for Dr. Pat? You can reach us at LetsAdoptaDogPark@gmail.com. 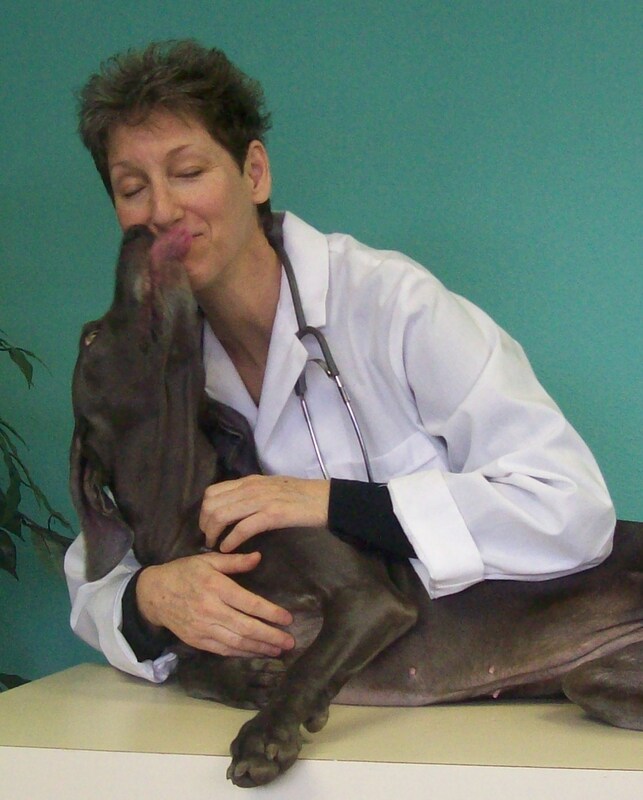 For a personal consultation about your pet's needs, visit Holistic Veterinary Services.